A cursed do-it-yourselfer, Jenny Evans started her business while still in college. Not happy with the opportunities available, she decided to define her job and success on her own terms and PowerHouse Performance was born. Jenny is obsessed with human performance and has created a career and life designed around maximizing her own potential, and helping others do the same. With a blend of confidence, creativity, stubbornness and some naivete (which is sometimes key), she has gone headlong into following her passion and purpose...and figured out how to make a living while doing it. 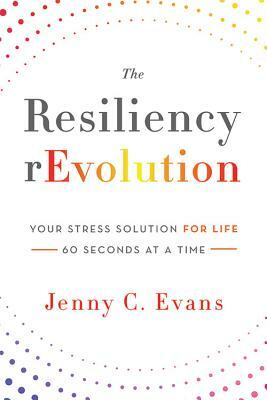 Jenny is a speaker, award-winning author and on-air expert on resiliency, stress, confidence and human performance. She is founder and CEO of PowerHouse Performance and author of the award-winning book The Resiliency rEvolution: Your Stress Solution for Life - 60 Seconds at a Time. Working with thousands of C-suite executives, leaders and employees worldwide, Jenny's dynamic presentations move audiences to define and achieve success in both business and life...all in the face of the unrelenting demands of being a human in the 21st century. Audiences tap into their personal power and confidence, as well as learn how to increase their capacity for stress and to recover from it more quickly and effectively. Clients improve their performance and productivity, all while enhancing their health. Jenny has spoken on the TEDx stage, writes as a blogger for The Huffington Post and was NBC KARE 11's Health & Fitness expert for over four years. She has been quoted on National Public Radio, in Health Magazine and Women's Health, while being showcased on FastCompany.com, Inc.com, Entrepreneur.com, Shape.com and Elle.com. She holds a Bachelor of Science in Kinesiology with an emphasis on Psychology from the University of Minnesota, has been an American Council on Exercise Certified Personal Trainer and Group Fitness Instructor for over 20 years, and is a certified Exercise Nutritionist. In her spare time she is a competitive athlete, races duathlons and is an aerial arts performer...because you never know when you're going to need a backup plan. Jenny's corporate client list includes Yale School of Management, AT&T, Estee Lauder Companies, Comcast, Nationwide, Ameriprise Financial, Procter & Gamble, Target, Human Performance Institute and many other Fortune 500 companies.